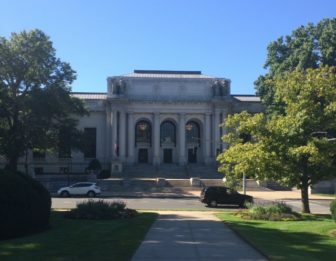 The state’s high court has unanimously decided the University of Connecticut was not justified in firing an employee found getting high on marijuana while on the job, a case attorneys for the state argued would have broad implications for state employees. The court ordered that the employee be given his job back. The case surrounds the arrest of Gregory Linhoff, a skilled maintainer at the UConn Health Center, who was fired after getting caught smoking marijuana in a state vehicle at the beginning of his shift and for possessing three-quarters of an ounce of the drug. Linhoff pleaded that the punishment was too severe, that he had a solid 15-year work history at UConn and that he brought the drug and pipe to work inadvertantly. His union, the Connecticut Employees Union Independent, SEIU, Local 511, AFL-CIO, fought the 2012 firing, and an arbitrator eventually agreed with the union that firing him was too harsh. “The misconduct at issue was completely unacceptable, and we do not condone it. Nevertheless, its egregiousness was tempered, at least to some degree,” they wrote. The state’s attorney general didn’t think the firing was too harsh. The arbitration award “sends a message to state employees and taxpayers that prohibited drug use on the job will be tolerated. In light of our strong public policies against illegal drug use, possession and impaired driving, the public should expect and demand that State employees refrain from criminal conduct while on duty, and from conduct that jeopardizes the safety of others,” reads a brief to the court from the state. The justices were not persuaded. The state had appealed the arbitration decision to Superior Court, and, after a lengthy trial, a judge sided with the state, ruling UConn officials were justified in firing Linhoff, whose job requires the use of complex motorized equipment, the operation of trucks of five tons or greater capacity, physical agility and auditory acuity, as well as access to HVAC, rooftops and fire escapes. The union argued that Linhoff was “dealing with serious personal struggles” after his wife filed for divorce and he had a cancer scare. “Defendant believed that smoking marijuana helped to alleviate stress and anxiety,” the union wrote in an appeal to Connecticut’s high court, pointing out that Linhoff was diagnosed with depression and anxiety. The Supreme Court also ordered that the arbitrator’s decision, which had granted Linhoff back pay, be reinstated. A spokeswoman for UConn decline to comment on the ruling.